Abstract: Local anesthetics are given routinely by health care workers ranging from nurses and technicians to anesthesia personnel and physicians. There is concern for local anesthetic systemic toxicity ranging from mild neurological symptoms of dizziness and disorientation to cardiovascular collapse. Current recommendations regarding maximum dose of local anesthetics are weight based and do not consider patient risk factors, concurrent medications, location of block, and total local anesthetic dose. Moreover, clinicians do not always take into account previously administered dosages of local anesthetics before giving more. 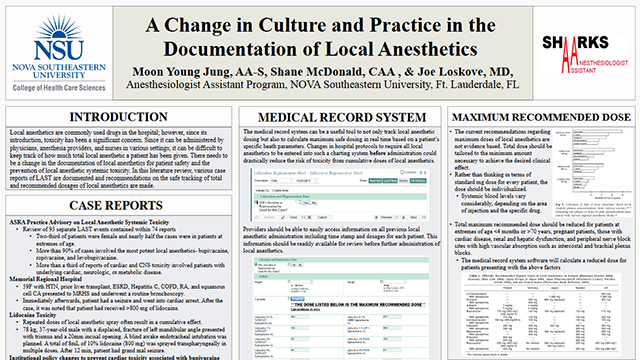 We propose a change to the electronic medical system in the documentation of local anesthetics. Summary: Local anesthetics are commonly used drugs in the hospital; however, since its introduction, toxicity has been a significant concern. Since it can be administered by physicians, anesthesia providers, and nurses in various settings, it can be difficult to keep track of how much local anesthetic a patient has been given. In this literature review, various case reports of LAST are documented and recommendations on the safe tracking of total and recommended dosages of local anesthetics are made. References: Mehra, P., Ciazzo, A., and Maloney, P (1998). Lidocaine Toxicity. Anesthesia Progress. 45(1):38-41. Neal, J. M., Bernards, C. M., Butterworth, J. F., Di Gregorio, G., Drasner, K., Hejtmanek, M. R., Mulroy, M. F., Rosenquist, R. W., and Weinberg, G. L (2010). ASRA Practice Advisory on Local Anesthetic Systemic Toxicity. Regional Anesthesia & Pain Medicine. 35(2):152-161. Rosenberg, P. H., Veering, B. T., and Urney, W. F (2005). Maximum recommended doses of local anesthetics: A multifactorial concept. Obstetric Anesthesia Digest. 25(3):118-119. Rubin, D. S., Matsumoto, M. M., Weinberg, G., and Roth, S (2018). Local Anesthetic Systemic Toxicity in Total Joint Arthroplasty: Incidence and Risk Factors in the United States From the National Inpatient Sample 1998-2013. Regional Anesthesia and Pain Medicine. 43(2):131-137.